A multivitamin for women should consist of the crucial vitamins and minerals formulated to your body needs such as vitamins A, B-3, B-6, C, D, folate, calcium, iron, magnesium, manganese, and zinc. Many women are iron deficient, but be aware that too much iron can actually hurt your body. The best pills will only use all natural ingredients, contain no artificial fillers, binders, colors, or flavorings, and contain no heavy metals. They should also be easy to take and not make your stomach upset. Some products include probiotics and enzymes to help make with digestion. To help us analyze each product we used the independent tests from labdoor.com which measured the label accuracy, product purity, and nutritional value. To make our final list we also read multiple reviews on all the top brands and combined all the information we gathered into one final rating for each supplement. Below we review the best multivitamins for women. Buyers should be aware that the prices listed were the prices at time of publication and are subject to change. Amazon also offers subscription rates on many of these items for a pretty significant discount. At the bottom of this article we also have a comparison chart of each multivitamin with their amounts of each primary vitamin or mineral*. With this you can easily compare one multivitamin versus another. We also have a list of ingredients if you want to look into each product in even more detail. 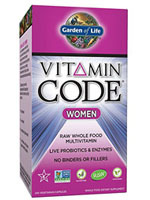 We feel the best multivitamin for women is the Garden of Life Vitamin Code For Women which sells for $39.38 or a price per serving of $0.66. It scored the number one ranking for highest quality from labdoor.com. The serving size is 2 pills twice a day with or without food. It contains raw, organic, whole food supplements that are never heated above 115° F to provide the vitamins and minerals you need most. It also contains live probiotics and enzymes that aid in digestion. Maybe more importantly is what these vegetarian capsules do not contain – no gluten or dairy, no binders or fillers, no artificial ingredients, no GMOs, and no soy. Put simply these pills have everything you want and nothing you don’t. Another excellent supplement is NOW Foods Eve Superior Women’s Multivitamin Softgels which sells for $22.55 or a price per serving of $0.38. The serving size is 3 softgels per day which are designed to be easier to swallow and are formulated for better GI tolerance. However, the pills are quite large. The minerals and vitamins included are formulated for women, plus additional ingredients like evening primrose, cranberry, green tea, horsetail, silica, and CoQ10 are also included. It also contains 6 mg of iron which is 33% of your daily recommendation – many multis contain what some might consider is too much iron. The most expensive women’s multivitamin on our list is the Thorne Research – Basic Nutrients IV with Copper and Iron which sells for $44 for a bottle of 180 capsules which equals $1.47 per serving. This product is formulated to support the active lifestyle of women who have not gone through menopause or anyone who needs additional iron. Thorne products use the best ingredients like chelated minerals for optimal absorption. Many cheap brands use nutrients that are not easy for your body to absorb, so you end up expelling them through your body without using them. Basic Nutrients IV is lacking Vitamin K and Coenzyme Q10 which some other brands have in their products. 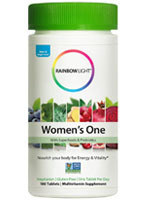 The Rainbow Light Women’s One is the cheapest multivitamin for women to make our list with a cost of just $0.21 per serving or $38.49 for a bottle of 180 tablets which are taken just one each day. Each tablet contains key vitamins and minerals like 800 IU of vitamin D3 for bone health and a complete B-complex for energy. It also contains a blend of organic spirulina, dong quai, red clover, and vegetable juice complex. With the help of plant enzymes and probiotics they are easy on digestion. The Women’s One is free of dairy, gluten, sugar, wheat, soy, nuts eggs, fish, shellfish, and yeast. Rounding out the top 5 on our list is GNC Women’s Ultra Mega One Per Day with a price of about $19.99 and price per serving of $0.33. Each bottle contains 60 caplets that you take 1 per day with food. This supplement contains 1600 IU of vitamin D3 and 500 mg of calcium to strengthen bones. It also has a hair, skin, and nail beauty blend with collagen and biotin. Users should be aware that this product contains fish and soybeans. The last women’s multivitamin to score at least a 9.0 rating in our review is Optimum Nutrition Opti-Women which sells for $14.87 or a price per serving of $0.25. Each bottle has 120 capsules with a daily dosage of 2 pills per day. Opti-Women has 23 vitamins and minerals including calcium, iron, and folic acid and 17 specialty ingredients such as ostivone, soy isoflavones, uva ursi, garcinia and more. Users should be aware that the herbs chasteberry and dong quai can interfere with birth control pills and your hormonal system. 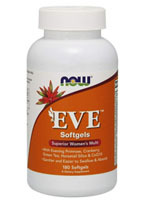 NOW Foods Eve Superior Women’s Multivitamin Softgels 9.2 $22.55 180 Take 3 softgels daily with food 3 60 $0.38 No No No 5000 IU 100% 200 mg 333% 1000 IU 250% 150 IU 500% 80 mcg 100% 25 mg 1667% 25 mg 1471% 25 mg 125% 25 mg 1250% 800 mcg 200% 140 mg 14% 100 mg 25% 15 mg 100% 200 mcg 286% 6 mg 33% Vitamin A (100% as Beta-Carotene) (Betatene) 5000 IU, Vitamin C (From Calcium Ascorbate) 200mg, Vitamin D-3 (As Cholecalciferol) 1000 IU, Vitamin E (As d-alpha Tocopherol) 150 IU, Vitamin K (As Menaquinone and Phytonadione) 80mcg, Thiamin (Vit. B-1) (From Thiamin HCI) 25mg, Riboflavin (Vitamin B-2) 25mg, Niacin (Vitamin B-3) (From Niacinamide and Inositol Hexanicotinate) 25mg, Vitamin B-6 (From Pyridoxine HCI and Pyridoxal-5-Phosphate (P-5-P)) 25mg, Folate (As Folic Acid) 800mcg, Vitamin B-12 (As Methylcobalamin) 120mcg, Biotin 300mcg, Pantothenic Acid (Vitamin B-5) (From Calcium Pantothenate) 50mg, Calcium 140mg, (From Aquamin Seaweed Derived Minerals Cal. Carbonate Ascorbate Pantothenate), Iron (From Ferrochel Iron Bisglycinate) (TRAACS) 6mg, Iodine (From Potassium Iodide) 225mcg, Magnesium 100mg, (From Mag. Citrate Mag. Oxide and Aquamin Seaweed Derived Minerals),Zinc (From Zinc Bisglycinate) (TRAACS) 15mg, Selenium (From Selenium Amino Acid Complex) (TRAACS) 200mcg, Copper (From Copper Bisglycinate) (TRAACS) 1mg, Manganese (From Manganese Bisglycinate) (TRAACS) 2mg, Chromium (From Chromium Chelavite) (TRAACS) 120mcg, Molybdenum (From Molybdenum Bisglycinate) (TRAACS) 75mcg, Potassium (From Potassium Chloride) 25mg, Evening Primrose Oil (Oenothera biennis) (Seed) 500mg, Cranberry Concentrate (Vaccinium macrocarpon) (Fruit) 100mg, Horsetail Extract (Equisetum Arvense) (Aerial Parts) (Min. 8% Silica) 50mg, Alpha Lipoic Acid 25mg, Choline (From Choline Bitartrate) 25mg, Grape Seed Extract (Vitis Vinifera) 25mg, Inositol 25mg, CoQ10 (As Ubiquinone) 10mg, Lycopene (LYC-O-MATO) (From Natural Tomato Extract) 500mcg, Lutein (FloraGLO (From Marigold Flowers) 500mcg; Other Ingredients: Softgel capsule (gelatin, glycerin, water, carob), flax seed oil, soy lecithin and beeswax. 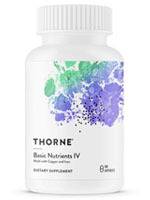 Thorne Research – Basic Nutrients IV with Copper and Iron 9.2 $44.00 180 Take 3-6 capsules per day 6 30 $1.47 No No No 2.63 mg 292% 850 mg 944% 25 mcg 125% 268 mg 1787% 0 0% 40 mg 3333% 11 mg 846% 160 mg 1000% 10 mg 588% 1.7 mg DFE 425% 210 mg 16% 150 mg 36% 15 mg 136% 200 mcg 364% 15 mg 83% Vitamin A (1875 mcg from Beta Carotene and 750 mcg as Palmitate) 2.63 mg, Vitamin C (as Ascorbic Acid) 850 mg, Vitamin D (as Vitamin D3) (1000 IU) 25 mcg, Vitamin E (as d-Alpha Tocopheryl) 268 mg, Thiamin (as Thiamin HCl) 40 mg, Riboflavin (as Riboflavin 5′-Phosphate Sodium) 11 mg, Niacin (130 mg as Niacinamide and 30 mg as Niacin) 160 mg, Vitamin B6 (as Pyridoxal 5′-Phosphate) 10 mg, Folate (500 mcg as Calcium Folinate and 500 mcg as L-5-Methyltetrahydrofolate from L-5-Methyltetrahydrofolic Acid, Glucosamine Salt) 1.7 mg DFE, Vitamin B12 (225 mcg as Adenosylcobalamin and 225 mcg as Methylcobalamin) 450 mcg, Biotin 400 mcg, Pantothenic Acid (as Calcium Pantothenate) 413 mg, Choline (as Choline Citrate) 35 mg, Calcium (120 mg as Calcium Citrate and 90 mg as Calcium Malate) 210 mg, Iron (as Iron Picolinate) 15 mg, Iodine (as Potassium Iodide) 225 mcg, Magnesium (90 mg as Magnesium Citrate and 60 mg as Magnesium Malate) 150 mg, Zinc (as Zinc Picolinate) 15 mg, Selenium (as L-Selenomethionine) 200 mcg, Copper (as Copper Picolinate) 1.5 mg, Manganese (as Manganese Picolinate) 6 mg, Chromium (as TRAACS Chromium Nicotinate Glycinate Chelate) 200 mcg, Molybdenum (as TRAACS Molybdenum Glycinate Chelate) 100 mcg, Boron (as Bororganic Boron Glycinate Complex) 3 mg, Lutein (from Aztec Marigold extract (flower) (Tagetes erecta)) 144 mcg, Vanadium (as Vanadium Picolinate) 100 mcg; Other Ingredients: Hypromellose (derived from cellulose) capsule Microcrystalline Cellulose Calcium Laurate Silicon Dioxide. Rainbow Light Women’s One 9.2 $38.49 180 Take 1 tablet daily 1 180 $0.21 Yes No Yes 900 mcg 100% 60 mg 67% 50 mcg 250% 15 mg 100% 120 mcg 100% 20 mg 1667% 20 mg 1538% 20 mg 100% 20 mg 1176% 400 mcg 100% 100 mg 8% 100 mg 25% 11 mg 100% 55 mcg 100% 6 mg 33% Vitamin A (as beta-carotene) 900mcg, Vitamin C (as ascorbic acid) 60mg, Vitamin D (as cholecalciferol) 50mcg, Vitamin E (as d-alpha tocopheryl succinate) 15mg, Vitamin K (as phytonadione) 120mcg, Thiamin (as thiamin mononitrate) 20mg, Riboflavin (vitamin B2) 20mg, Niacin (as niacinamide) 20mg, Vitamin B6 (as pyridoxine hydrochloride) 20mg, Folate (as folic acid) (240 mcg folic acid) 400mcg DFE, Vitamin B12 (as methylcobalamin) 10mcg, Biotin 30mcg, Pantothenic Acid (as calcium pantothenate) 13mg, Choline (as choline bitartrate) 55mg, Calcium (from mineral-rich red algae) 100mg, Iron (as iron amino acid chelate) 6mg, Iodine (from inactivated Saccharomyces cerevisiae) 150mcg, Magnesium (as marine magnesium extract from sea water) 100mg, Zinc (as zinc citrate) 11mg, Selenium (as selenomethionine) 55mcg, Copper (as copper amino acid chelate) 0.9mg, Manganese (as manganese citrate) 2.3mg, Chromium (as chromium picolinate) 100mcg, Molybdenum (as molybdenum amino acid chelate) 45mcg; Women’s Vitality Blend 91mg: Organic chlorella grape (whole fruit) extract organic pomegranate (fruit) juice powder lutein. ; Organic Rainbow Vibrant Foods Blend 80mg: Organic spirulina organic beet (root) organic broccoli (plant) organic kale (leaf) organic spinach (leaf) organic blackberry (fruit) organic blueberry (fruit) organic carrot (root) organic cranberry (fruit); Digestive Support Blend 33mg: Ginger (root) juice extract amylase (180 DU) protease (720 HUT) xylanase (96 XU) maltase (5 DP) glucoamylase (1 AGU) hemicellulase (738 HCU) beta-glucanase (21 BGU) phytase (0.1 FTU) cellulase (29 CU) alpha-galactosidase (5 GalU) lipase (26 FIP) lactase (8 ALU) invertase (4 SU) Bacillus coagulans MTCC 5856 (25 million CFU); Citrus (Fruit) bioflavonoids 25mg, Inositol 20mg, Boron (As Boron Glycinate) 1mg; Other Ingredients: Microcrystalline cellulose coating (hydroxypropyl cellulose) hydroxypropyl methyl cellulose. 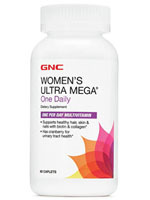 GNC Women’s Ultra Mega One Per Day Multivitamin 9.1 $19.99 60 Take 1 tablet daily with food 1 60 $0.33 No No No 3500 IU 70% 100 mg 167% 1200 IU 300% 35 IU 117% 80 mcg 100% 1.65 mg 110% 1.87 mg 110% 20 mg 100% 2.2 mg 110% 800 mcg 200% 500 mg 50% 100 mg 25% 30 mg 200% 70 mcg 100% 18 mg 100% Magnesium (as Magnesium Oxide) 100mg, Iron (as Ferrous Fumarate) 18mg, Phosphorus (as dicalcium phosphate) 15mg, Iodine (as Potassium Iodide) 150mcg, Zinc (as Zinc Oxide) 30mg, Selenium (as Sodium Selenite) 70mcg, Copper (as Cupric oxide) 2mg, Manganese (as maganese sulfate) 2mg, Chromium (as Hydrolyzed Protein Chelate) 200mcg, Molybdenum (as Hydrolyzed Protein Chelate) 75mcg, Chloride (as Potassium Chloride) 72mg, Potassium (as Potassium Chloride) 80mg, Folic Acid 800mcg, Vitamin A (as Retinyl Acetate) 3500IU, Vitamin C (as Ascorbic Acid) 100mg, Vitamin D (as Cholecalciferol D-3) 1200IU, Vitamin E (as Natural d-alpha Tocopheryl Succinate) 35IU, Vitamin K (as Phytonadione) 80mcg, Thiamin (Vitamin B-1) (as Thiamin Mononitrate) 1.65mg, Riboflavin (Vitamin B-2) 1.87mg, Niacin (as Niacinamide) 20mg, Vitamin B-6 (as Pyridoxine Hydrochloride) 2.2mg, Biotin 300mcg, Pantothenic Acid (as Calcium d-Pantothenate) 16.5mg, Calcium (as Calcium Carbonate and Dicalcium Phosphate) 500mg; Brain Health Blend: Choline (as Choline Bitartrate) 2.5 mg, Inositol 2.5; Eye Health & Antioxidant Protection Blend: Lutemax 2020 Lutein 1 mg, Zeaxanthin (as Zeaxanthin Isomers) 200 mcg; Women’s and Urinary Tract Health Blend: Cranberry Fruit Concentrate 10 mg, Boron (as Hydrolyzed Protein Chelate) 150 mcg, Tin (as Stannous Chloride) 10 mcg, Vanadium (as vanadyl sulfate) 10 mcg, Nickel (as Nickel Sulfate) 5 mcg; Beauty from Within Blend: Collagen Hydrolysate 5 mg, Silica (as Silicon Dioxide) 2 mg; Other Ingredients: Cellulose, Titanium Dioxide, Vegetable Acetoglycerides, Cool Mint Vanilla Flavor, Sucralose. 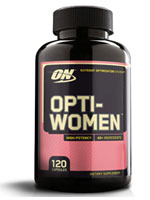 Optimum Nutrition Opti-Women 9 $14.87 120 Take 2 capsules per day 2 60 $0.25 No No No 5000 IU 100% 250 mg 417% 600 IU 150% 100 IU 333% 80 mcg 100% 20 mg 1333% 20 mg 1176% 20 mg 100% 20 mg 1000% 600 mcg 150% 150 mg 15% 75 mg 19% 15 mg 100% 70 mcg 100% 18 mg 100% Vitamin A (as beta carotene, vitamin A palmitate) 5000 IU, Vitamin D (as Cholecalciferol) 600 IU, Vitamin K (as phytonadione) 80 mcg, Riboflavin 20 mg, Vitamin B6 (as Pyridoxine Hydrochloride) 20 mg, Vitamin B12 (as Cyanocobalamin) 100 mcg, Biotin 250 mcg, Pantothenic Acid (as d-Calcium Pantothenate) 20 mg, Iodine (as Kelp) 200 mcg, Manganese (as Manganese Gluconate) 75 mg, Zinc (as Zinc Citrate) 15 mg, Copper (as Copper Gluconate) 2 mg, Molybdenum (as Molybdenum A.A. Chelate) 70 mcg, Vitamin C (as Ascorbic Acid) 250 mg, Vitamin E (as d-alpha Tocopheryl Succinate) 100 IU, Thiamin (as thiamin hydrochloride) 20 mg, Niacin (as Niacinamide) 20 mg, Folic Acid 600 mcg, Calcium (as calcium carbonate, citrate) 150 mg, Iron (as Iron A.A. chelate) 18 mg, Selenium (as selenomethionine) 70 mcg, Magnesium (as magnesium oxide, aspartate) 5 mg, Chromium (as Chromium GTF) 120 mcg, Dong Quai (Angelica Sinensis) 4:1 Root extract 80 mg, Chasteberry (Vitex agnus-castus) 4:1 Berry Extract 50 mg, Garcinia Extract (Garcinia cambogia)(rind) (standardized to 52% HCA) 50 mg, Uva Ursi, powdered (leaf) 50 mg, Horse Chestnut Extract (Aesculus hippocastanum) (root)(standardized to 20% aescin) 25 mg, Alpha Lipoic Acid 20 mg, Butchers Broom, powdered (root) 15 mg, Ostivone (as isopropoxy isoflavone) 10 mg, Grape Seed Extract (Vitis vinifera)(seed)(standardized to 95% polyphenols) 10 mg, Deodorized Garlic, powdered (bulb) 10 mg, Citrus Bioflavonoids (fruit) 10 mg, Soy Isoflavones 2 mg, Lycopene (as LYC-O-MATO natural tomato lycopene) 250 mcg, Lutein 250 mcg, Alpha-carotene 93.5 mcg, Cryptoxanthin 22.8 mcg, Zeaxanthin 18.7 mcg; Other Ingredients: Hypromellose, Magnesium Stearate, Calcium Phosphate, Microcrystalline Cellulose, Silica. * Our comparison chart may not list every single vitamin or mineral contained by each product. We try to list the main ones that most people look for. Check the ingredient list for more info or go to the store for each product and click on the supplement info label image for more details on each individual product.